This Visions 16" PET plastic catering / deli tray is perfect for displaying hors d'oeuvres, cheeses, and desserts at your next party or catered meal. Its sleek black design provides a bold edge to any presentation, and is sure to make your food displays irresistible. Plus, as your food disappears, a stylish wavy design is revealed for an attractive look. we used these for sandwich drop off parties. it is very durable and great quality! i purchase this tray with the dome and my party tray looks great! We like to use use these for catering trays that serve approximately 15-20 as appetizers. We find that you can wash these if they have minimal use and they work great! I use the 16" Thermoform Catering/Deli Tray with the 16" Clear PET Plastic Round Catering High Dome Lid for cookie platters. The plastic of these trays can be a bit slippery and if cookies aren't packed properly, they slide around. The 16" tray holds up to 3 dozen of my 3" sugar cookies. These are good quality catering and gift trays that won't break the bank! It's easy to use one of these trays for catering needs and not worry about the cost you are out by leaving them behind. I recommend these trays with the matching lids. I use these for my large cookie trays and fit 10 dozen of cookies on this tray size. LIds fit well on the bottoms and can be removed and put back on with no troubles. Great medium size with a decorative spiral design. Sturdy enough to hold loaded sandwiches. I normally turn the top over and include chips. Well worth the price. I love these catering trays! First, they look incredible! They are stunning and are well-made. We load these trays up with so much food and they are hold up very well. They are not flimsy and are worth the price. They are also great to transport. If you purchase the high lids, you can plate everything and throw the lid on and its ready to go when you arrive to the event. I would be lost without these trays! These trays are heavy duty and can withstand some weight. They work perfect for meat and cheese platters and veggie platters. Excellent price to try them out before committing to the bulk price and set. Great item to help keep our buffet table looking fresh. Sometimes we cover the tray with plastic film and send to our homeless shelters at holiday time. We are happy with the quality and style of these trays. We use them for our brownies and cookies that we send on caterings. They are fairly durable and can be reused if returned. These trays are sturdy and beautiful. They held up well for our dessert trays and condiment trays we done a few weeks back! Be sure to purchase the low or high dome lids that go with these as well! We buy this deli tray as our regular take out or catering tray because it is so sturdy, some of our customers have mentioned how they wash it and reuse it several times. Domes that go with it snap on tight, not like other brands. Ordered the “16 catering/deli tray for my cookie business. The tray is sturdy and well made. I like this product because the bottom is flat with a good 1/2 inch rim. Pairs perfectly with the “16 round clear low dome. Will be reordering! Thank you! Huge trays that you can’t find in store. Perfect for large platters or heavy food items. I can’t wait to use these at my next catering job. These black trays are great for catering needs. The coordinating lids snap on well and stack easily. The plastic is sturdy and the price is good. This catering tray meets all of our catering needs. We use these for vegetables and sandwiches. They are sturdy and durable and very easy to clean. These are great for serving large amounts of cookies. They give your product a professional appearance and when combined with the lids make transporting simple. A great catering tray. We love this size for larger office orders. My only wish is that this company also sold a 14" tray so I could have even more options. These are excellent for cookie platters. The lid, sold separately, fits snuggly and easily on top. There’s a little space to adhere a label right in the middle. Love these! These catering platters look great with sandwiches, wraps, fruit, crackers, cheese, anything on them! I'd get a case and experiment with how you can change your menu! A great, sturdy tray for cold or room temperature items. I will be using these for breads, crackers and toasts. Works well with the dome lids . Great trays, we do a lot of off site and drop off catering it is nice to have these trays. The price is good so it we do not get them back from an event there is no harm and if we do get them back they are durable enough to reuse a couple of times. These trays are sturdy and of a good quality. We used them for veggies and dip, placing a small round container in the middle (not included). The black was shiny and provided for an extra nice presentation. We also purchased the 16" Dome Lid, which complimented the tray nicely and made it easy for transporting. Would recommend this product. These catering trays are perfect for fruit or vegetable platters, cracker platters, and wrap/sandwiches. I like to using this for all sorts of catering needs. LOVE these trays! We use them for anything from sandwiches to cookies to cupcakes. The space allows flexibility with product use and design. The associated dome lid makes any product look professional with its clean look and design. We love these things... use them all the time for corporate gigs. We buy them regularly and would feel comfortable suggesting them to any other caterer. We use these trays a lot and they are very sturdy and great for catering orders. We never have any problems with them and the lids snap on easily. We use these on our to-go catering orders. the different sizes allow us to customize them for our different size to-go catering orders. They are sturdy and reliable. Nice looking, standard black catering trays. They are attractive and seem pretty sturdy. We will order this product again as we need more. Definitely recommended! These are great catering trays with a nice design. They are heavy, and do not sag when the food is piled onto it. A nice classy look for catering. These 16" trays work well with the 16" lids, sturdy construction good quality plastic. They work as described and have a nice solid snap to them. The Vision Thermoform deli tray is great for our catering needs. The lids stays in place and fits well. We use them for sandwiches, cookie, and much more. The quality is good, not too flimsy. I would recommend using the thicker quality for increased transporting and if you want to reuse. I couldn't have asked for better trays. These trays are the perfect size for just about anything you want to keep fresh, from cookies and cupcakes to lunchmeat. They are much more sturdy than the ones you get in other places. The lids snap on easily. This tray works really well for catering subs. It will hold 18 - 3" subs on one tray along with a bowl for pickles. Perfect size, subs don't get smashed, and presentation looks great. We use these trays for our medium platters for catering events. They hold the perfect amount of food for these particular platters, look nice, and are very durable. We love these Catering Trays! They work so well and are not nearly as expensive as the other ones we were getting from our regular vendor. These are a great size. I use them for King Cakes for Mardi Gras, deli sandwich platters for catering and using them for a sweets platter with a variety of treats. They are of good quality and very versatile. Love these platter plates. They look fabulous. Even more important. They are thick, sturdy & reliable platter plates. I got the appropriate top to fit the platter plate. It does exactly that. Seals all my baked goods for transportation. Giving an everlasting impression. Great item have ordered them multiple times. Perfect for so many items. These are sturdy and perfect thickness to hold what ever needs to be served or delivered. These trays are identical to the ones they sell at Restaurant Depot at a much more affordable price. 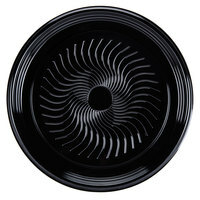 We use these for bagel and fruit platters and they look great, and are reusable if you wash them. These trays are durable and study. I like that different sizes are offered at such great prices. We keep these on hand for catering deliveries. I loved these!!! They came in super handy for bars and buns at my son's grad party! And, for the price, it was so nice to have extras to just swap out! Even though they're disposable, my helpers washed them up and they're still usable! I purchased these to use for a graduation and for tailgating. They are HIGH Quality and sturdy. I used it for fruit trays and cookies/bars. I would definitely recommend this product. Trays are very nice and sturdy and look good too! The top fits without any hassle. Cost effective too. Use them for sandwiches and line the bottom with lettuce or spinach. Use them for desserts and line the bottom with wrinkled parchment or wax paper. I used these for holiday cookie platters... They are very sturdy, the 16' dome lids I ordered to go with these trays were also very sturdy, and I was able to stack 25 trays in stacks of 5 with no problem. The platters were a good size for about 20 half sandwiches. The reason for giving 3 stars is that there was actually a platter with a hole in it! That's unacceptable in a pack of 25 and there is no way to return the pack when we are half way through it. Thanks for the feedback on these trays. We're sorry one of the them had a hole in it. A Customer Solutions Representative will contact you about this shortly. Great tray for sandwiches. Also great for desserts and other treats. Well designed and very strong construction. Will be buying these again. Very impressed by this product. I have used these trays with both the high dome and low dome lids. I love that they are so sturdy and stack well with the lids without sliding around when delivering. This is easily handled by by employee and the lid perfectly fits this. It is very presentable tray and I highly recommend it to everyone. The deli trays are great for packaging finger foods for delivery. The capacity is great and design is aesthetically pleasing; the sleek design means that it fits into a party environment seamlessly. This larger sized tray is sturdy enough to work with our bagel platters. We use them often and will continue to do so in the future! We use these deli trays regularly for our catering orders and they are great for the price. They fit 20 burritos cut in half and the burritos look beautiful when serving. I've never had a tray that doesn't snap/ fit perfectly with the lid when using this brand. Looks great with sandwiches or cookie trays. This size is nice for sandwiches. Thank you! I love the durable material that theses platter's are made of and I love design on the bottom of the tray and they are safe in transportation. I am really happy with these trays. I only wish they had a lid that went with them. I have been using them for all the cookies I am making this Christmas. It looks very professional when wrapped in cellophane.